Weighty Matters: What can YOU do about Health Check? Horrifyingly, the picture above was taken in the cafeteria of the Ottawa General Hospital where Health Check'ed Slush Puppies are pushed on an unsuspecting public. 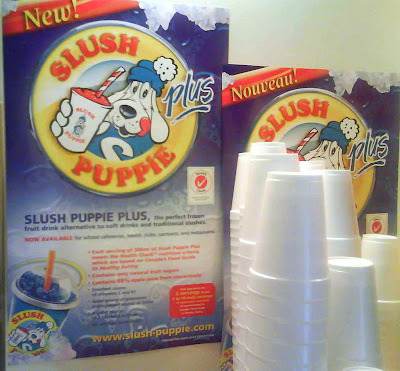 Will Canadians really benefit from a front-of-package labeling program that endorses Slush Puppies as a healthy choice? If you're like me and think the answer is a definite "NO", what can you do? Well, if it's your first time here, you can educate yourself. Follow Health Check and Eat a Full Cup of Sugar a Day! If you're already outraged, then I believe it's time for you to write. First you can write to the Heart and Stroke Foundation - to the bosses and also to the people directly responsible for the Health Check criteria. Well, I had mentioned in a prior post that on the Health Check's website there's reference to an expert technical advisory committee that established and oversee the Health Check criteria. I had also mentioned that the names of those experts were nowhere to be found on the site and that it seemed odd to me that they weren't there. Well, thanks to a kind reader, I've got the names of Health Check's Technical Advisory Committee as of January 2006. Bretta Maloff, RD: She was the person interviewed by the CBC on the Marketplace expose, and is the chair of Health Check's technical advisory committee. She's been at Health Check from the very beginning having helped set the original Health Check nutritional criteria. Fran Berkoff, RD: She wrote the book, "Foods that Harm, Foods that Heal". Chantal Blais, RD: She's the head of Clinical Nutrition Service at the Clinical Research Institute of Montreal. Sharyn Joliat, RD, MSc: She runs her own nutritional analysis company Info Access Inc.
Allison M. Stephen, PhD: She's the head of nutritional epidemiology at the Medical Research Council's Human Nutrition Research in England. Laurie Wadsworth PhD: She's an assistant professor in the Department of Human Nutrition at St. Francis Xavier University in Antigonish. Bernard LeBlanc, BSc: According to the Health Check website (at least as of January 30th, 2008) he's "self- employed as a consultant to the food industry." So those seven folks presumably are in fact the dietitians (and the food industry consultant) that go shopping with you every time you buy Health Check'ed products. Do you think they've done a great job? Have they helped you and your families make "healthier" choices? You can also write your MP and let them know that you'd be quite unhappy were the government to adopt the Health Check as our official, national, front of package labeling program. If you don't know who your MP is, click here and using your postal code, you'll find out not only who it is, but also their email address. You can also spread the word. Link to this post, email it to friends, Stumble it, Digg it, Facebook it, whatever - if you're concerned, please help spread awareness. "It's always the right time to do the right thing"
Here's a wonderful opportunity for you to in fact do the right thing and in so doing, regain some of the trust you've lost through Health Check. I promise, were there real and evidence-based changes made, I would certainly be among the first to stand up and applaud. (Unfortunately, I'm missing email addresses for: Sharyn Joliat and Bernard LeBlanc - if anyone out there has them, please email me with them and don't worry, I protect my sources).